← Lighting is the Word in Lighting Restoration: Lighting Technologies Create New Issues for the Historic Project. Historic Buildings Show the Way to Build Durable Stone Facades for New Construction. NOT MY FAULT. 45 trailerloads of stone were removed from the facade of the Red Cross Building in Washington, DC, not because of any defects in the 50 year old material, but to accommodate a building addition. While off the building, the stone was refitted for new anchorage (note kerfs in the end of the stone) and equipped with laminated “liner” posts, intended to support some very wide units including a 30 inch thick, 20 ton lintel stone across the front of the building. Here, a freshly recut unit is dressed by James Farris, employee of Rugo and Carosi of Woodbridge, VA, the stone contractor for the project. Photo courtesy of Robert Young of Gothic Stone Restoration. Due to the cost of veneer stone and its reputation for durability, expectations for its performance are high. Failures in new construction in stone are embarrassing for the project team and baffling to the customer. Failures will happen because an unprecedented combination of factors has come together to make sure that they do. First, with new materials available and new tastes in architecture, the customer has options in unproven materials or styles imported from outside the local climate and building vernacular. Second, the reduced thickness of modern veneers leaves less room for error. Third, after many decades of relative low utilization, demand for this material has increased, both for new work and restoration, but the reserve of skilled and experienced artisans and designers has not kept up. 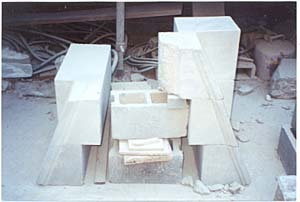 To discover if the artisan’s perspective could contribute to more confident specification of this material, we consulted with Robert Young, owner of Gothic Stone Restoration of New Haven, CT and a journeyman stone mason with New Haven Local #1 of the International Union of Bricklayers and Allied Crafts. Building stone is a natural material, Mr. Young notes, with very individual characteristics and many ways to fail. Every local climate is a unique natural environment, placing different stresses upon the material. Stone varies, for instance, in its ability to absorb heat and its rate of expansion. Such variations affect how it interacts with mortars or anchoring systems. If an attachment point is cut without full allowance for the relative rates of expansion of the stone and the steel anchor, stone breakage can result. Expanding stone can damage incorrectly formulated mortars. Caulk can be made brittle by overheating masonry units. Stone also varies in its capacity to absorb water and its ability to survive cyles of freezing and thawing in a wet climate. An impermeable mortar can damage a masonry unit by trapping freezing water within it. Even profile details can affect its performance. Details in traditional styles were developed to promote the runoff necessary in certain climates to insure that no damage occurred to the stone. Local usages evolved to match stone, mortar, anchorage and profiles for the most reliable performance. Installations which deviate from these usages without sufficient calculation risk failure. New materials without local references or credentials are available from quarries in Asia, Africa and South America. Beautiful and exciting as some of these materials are, the primary role of an exterior veneer is as a durable part of the building envelope and not as building ornament. REPLACEMENT PARTS. Chronic saturation of the massive walls of the seven story Sterling Memorial Library in New Haven, CT destroyed much of the limestone trim, including the gable quoins found at the top of the many buttresses that give the structure its distinctive 1930’s modern Gothic look. Sections of the facade were dismantled so that a full vapor barrier could be installed over the inner wall to protect the library collection within. Photo courtesy of Robert Young of Gothic Stone Restoration. Mr. Young suggests that the best template for developing durable specifications is a historic building using similar materials and similar details in a similar climate. The builders of historic facades relied upon materials and designs whose performance in the local climate was well understood. If there is any doubt about their choices, it should be removed after decades or centuries to the weather. If any true flaw is to be found, we can, with hindsight, make note and learn from it. The recent dismantling of two historic veneers furnished him an inside look at the anatomy of success and failure of historic facades. The 400 foot long facade of the Red Cross building (see photo above) was dismantled for no fault of its own but rather to accommodate a major expansion of the building. Before being reinstalled at its new location, however, its bearing and anchorage details were extensively re-engineered to modern standards. The seven story facade of the Sterling Library (see adjacent photo), on the other hand, suffered from chronic leaking and saturation of the wall core, a condition which damaged limestone trim and threatened an important library collection. Mr. Young notes three suggestions for the uneventful and painless specification of durable new stone facades and supports them with observations from these notable historic stone veneer projects. The first suggestion is that by specifying a proven stone, risk and issues can be more efficiently managed. In both of the cases cited, the use of Indiana limestone provided value through the ready availability of matching stone for replacements, repairs and for building additions. For buildings with a long life cycle, this is essential. The choice proved its value again in simplifying technical specification. There was at first controversy over the mortar to be used in the Red Cross facade, but in the end it was quite simply settled by following the long established specifications furnished by the Indiana Limestone Institute. 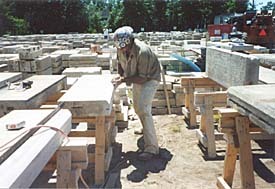 There are several thousand historic quarries in North America from which veneer stone is still more or less available. While some of these local materials may not be well supported by industry groups, they have all produced an inventory of existing historic structures which can be observed and analyzed to establish the character of the material and its requirements for success. Secondly, he suggests building big. Unit mass helps the veneer to achieve stability, dissipate heat and to disperse moisture. The ten-inch thick, one-ton units of the Red Cross facade demonstrated these advantages by being fifty years to the weather with no damage. The thickness of the material also allowed extensive restoration and retrofitting that today’s much thinner commercial veneers would not have tolerated. The project required the units to accept the installation of dutchmen to repair damage from the dismantling, new kerf cuts to accept a new anchorage system and the lamination of “liner” posts to provide full bearing to wider units high in the wall. Volume means durability. Third, pay close attention to the waterproofing details. Avoid details in the masonry or associated flashings which will promote concentrations of runoff likely to cause the leaking and saturations similar to those of the Sterling Library wall. Mr. Young believes that most of the damage to that facade was produced by the failure of systems dispersing runoff from the roof, not in the masonry itself. Even so, flashing and weeps were introduced into the masonry at key points to better manage water flow. Coping stone widths, projection pitches and drip profiles all help determine the rate at which the wall will shed water. Reproduction of successful details can forestall chronic problems. More assertive details may not be advisable in very porous stone. In the same vein, he further advises continued observation of the completed facade, for a period, to determine if the building manages to shed water as intended. A timely adjustment to a flashing or masonry detail can sometimes prevent premature and unnecessary damage to the stone facade. Attention is the key to performance. List of Stone Fabrication Specialists. This entry was posted in Dismantling, New Construction, Stonework and tagged Connecticut. Bookmark the permalink.